Torino Segway Tour is a cultural and emotional experience which aims to increase the enjoyment of your visit to and discovery of Turin. Book now your tour! A fun and enjoyable tour to discover the most evocative places in wonderful Turin! This is our classic tour which visits the most important points in the city. By way of Via Lagrange we reach the centre in Piazza San Carlo, where our wonderful itinerary begins, via squares, monuments, palazzos and museums. This tour gives you a flavour of all the Baroque charm of the Savoy capital. The tour “Ancient Routes of Hunting” aims to immerse you in the evocative atmosphere of the eighteenth-century Savoy court, retracing the ancient hunting routes designed by the famous architect Carlo Messina, Filippo Juvarra. Through the Royal Route, in the background the beautiful house and hearts ancient hunting paths can, have fun aboard the Segway and without any effort, excite you, observe nature and the beauty of this ancient architectural system environment, and then complete the experience with a rich tasting of products typical of the territory directly in the farmhouse manufacturer. Every city has its attraction and Turin’s is its ability to be particularly evocative, especially if you visit in optimal lighting conditions. The “emozioni serali” (evening emotions) tour shows you the city from its best perspective. The Monte dei Cappuccini hill, the stirring relationship between architecture and nature, the connection between hill and city. Landscapes, paths of light, a succession of different emotions from sunset to nightfall, views over the city carefully selected by an expert who has photographed the town for years, alongside the river that is so dear to the people of Turin, the Po. During the winter period (November – January), along with the “emozioni serali” (evening emotions) tour, you have the chance to visit one of the most important examples of light installations by some of the greatest artists in contemporary art. A thrilling tour through the squares, palazzos, museums and streets in the city centre: urban art scenery. Tourinpista© is another great tour designed to let you experience the thrill of riding the Segway along the spectacular spiral ramp of the Lingotto and to reach the historic track on the top of the factory building, a symbol of industrial architecture and today one of the largest multi-functional centres in Europe. A journey through the history of the car but also of architecture. You will be able to admire Renzo Piano’s famous Bubble and test the amazing parabolic curve. And more… thanks to the attentive service of the renowned “La Pista” restaurant you will be able to enjoy a sumptuous and refined aperitif/dinner with table position reserved only for Tourinpista© under the Bubble or near the parabolic curve. 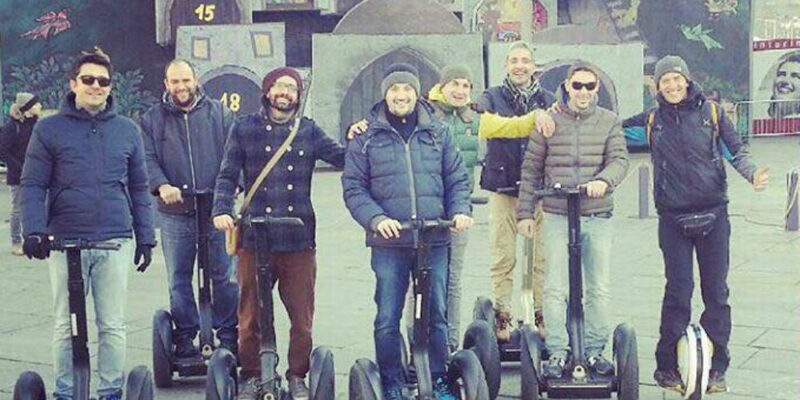 A thrill not to be missed, exclusively by Torinosegwaytour. The “ora blu” (blue hour) tour is a special moment of the day which does not last long, between the sunset and nightfall, when the sky turns a special shade of intense blue that creates a magical, surreal atmosphere around the architecture of the city, which is lit up artificially. Using the Segway, you can visit the most evocative places in our city centre while this phenomenon is occurring.